A handful of secreted morphogen signalling molecules, acting in a spatial and gradient-dependent manner, orchestrate the development of multicellular organism. Morphogen dysfunction leads to a range of diseases and defects in adult stem cell populations. Their importance in human disease has become increasingly clear over the past decade: dysfunctions of the pathways are known to lead to severe developmental and neurological diseases, and cancer. Our group seeks to generate mechanistic insights relevant to disease and embryonic development focusing on two fundamental morphogen signalling systems: the Hedgehog (Hh) and the bone morphogenetic protein (BMP) pathways. Extracellular Hh and BMP signals are mediated by various cell surface receptor molecules. We aim to unravel the molecular mechanisms underlying Hh and BMP morphogen gradient formation and signal transduction across the cell membrane. To achieve this, we are using structural biology techniques such as X-ray crystallography and cryo electron microscopy to obtain molecular snapshots of Hh and BMP interactions with other proteins. We combine atomic details from in vitro structural and biophysical studies on single molecules with analyses of Hh and BMP function in living cells. Our findings will be integrated with those from developmental and cellular biologists to provide a deeper understanding of these pathways and explore translational opportunities, for example in anti-cancer therapy. Structural, biochemical and biophysical studies of eukaryotic soluble and membrane proteins require their production in milligram quantities. Although large-scale protein expression strategies based on transient or stable transfection of mammalian cells are well established, they are associated with high consumable costs, limited transfection efficiency or long and tedious selection of clonal cell lines. Lentiviral transduction is an efficient method for the delivery of transgenes to mammalian cells and unifies the ease of use and speed of transient transfection with the robust expression of stable cell lines. In this protocol, we describe the design and step-by-step application of a lentiviral plasmid suite, termed pHR-CMV-TetO2, for the constitutive or inducible large-scale production of soluble and membrane proteins in HEK293 cell lines. Optional features include bicistronic co-expression of fluorescent marker proteins for enrichment of co-transduced cells using cell sorting and of biotin ligase for in vivo biotinylation. We demonstrate the efficacy of the method for a set of soluble proteins and for the G-protein-coupled receptor (GPCR) Smoothened (SMO). We further compare this method with baculovirus transduction of mammalian cells (BacMam), using the type-A γ-aminobutyric acid receptor (GABAAR) β3 homopentamer as a test case. The protocols described here are optimized for simplicity, speed and affordability; lead to a stable polyclonal cell line and milligram-scale amounts of protein in 3-4 weeks; and routinely achieve an approximately three- to tenfold improvement in protein production yield per cell as compared to transient transduction or transfection. Transduction of Hedgehog signals across the plasma membrane is facilitated by the class F G-protein-coupled-receptor (GPCR) Smoothened (SMO). Recent studies suggest that SMO is modulated via interactions of its transmembrane (TM) domain with cholesterol. 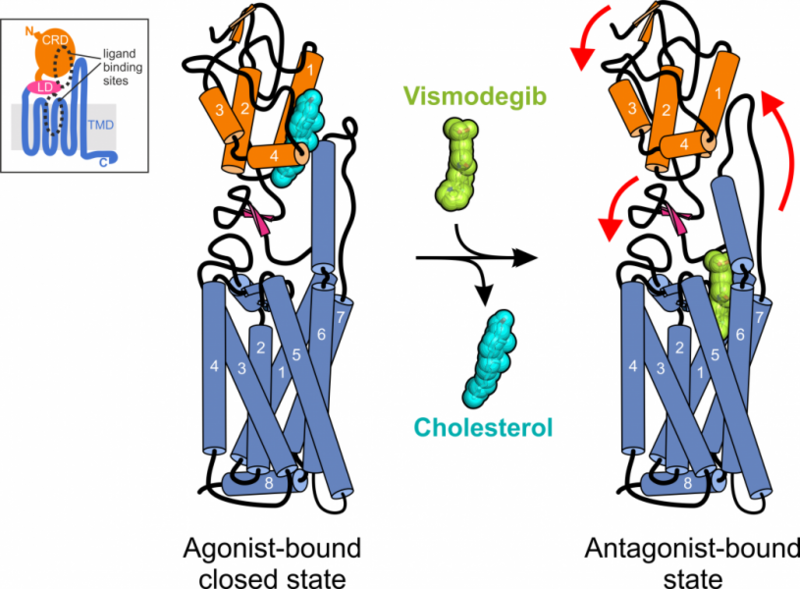 We apply molecular dynamics simulations of SMO embedded in cholesterol containing lipid bilayers, revealing a direct interaction of cholesterol with the TM domain at regions distinct from those observed in class A GPCRs. In particular the extracellular tips of helices TM2 and TM3 form a well-defined cholesterol interaction site. 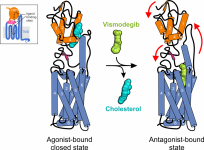 Potential of mean force calculations yield a free energy landscape for cholesterol binding. Alongside analysis of equilibrium cholesterol occupancy, this reveals the existence of a dynamic "greasy patch" interaction with the TM domain of SMO, which may be compared with previously identified lipid interaction sites on other membrane proteins. These predictions provide molecular-level insights into cholesterol interactions with a class F GPCR, suggesting potential druggable sites. The calcium-sensing receptor (CaSR) is a homodimeric G-protein-coupled receptor that signals via intracellular calcium (Ca2+i) mobilisation and phosphorylation of extracellular signal-regulated kinase 1/2 (ERK) to regulate extracellular calcium (Ca2+e) homeostasis. The central importance of the CaSR in Ca2+e homeostasis has been demonstrated by the identification of loss- or gain-of-function CaSR mutations that lead to familial hypocalciuric hypercalcaemia (FHH) or autosomal dominant hypocalcaemia (ADH), respectively. However, the mechanisms determining whether the CaSR signals via Ca2+i or ERK have not been established, and we hypothesised that some CaSR residues, which are the site of both loss- and gain-of-function mutations, may act as molecular switches to direct signalling through these pathways. An analysis of CaSR mutations identified in >300 hypercalcaemic and hypocalcaemic probands revealed five 'disease-switch' residues (Gln27, Asn178, Ser657, Ser820 and Thr828) that are affected by FHH and ADH mutations. Functional expression studies using HEK293 cells showed disease-switch residue mutations to commonly display signalling bias. For example, two FHH-associated mutations (p.Asn178Asp and p.Ser820Ala) impaired Ca2+i signalling without altering ERK phosphorylation. In contrast, an ADH-associated p.Ser657Cys mutation uncoupled signalling by leading to increased Ca2+i mobilization while decreasing ERK phosphorylation. Structural analysis of these five CaSR disease-switch residues together with four reported disease-switch residues revealed these residues to be located at conformationally active regions of the CaSR such as the extracellular dimer interface and transmembrane domain. Thus, our findings indicate that disease-switch residues are located at sites critical for CaSR activation and play a role in mediating signalling bias. Number and brightness is a calibration-free fluorescence fluctuation spectroscopy (FFS) technique for detecting protein homo-oligomerization. It can be employed using a conventional confocal microscope equipped with digital detectors. A protocol for the use of the technique in vitro is shown by means of a use case where number and brightness can be seen to accurately quantify the oligomeric state of mVenus-labelled FKBP12F36V before and after the addition of the dimerizing drug AP20187. The importance of using the correct microscope acquisition parameters and the correct data preprocessing and analysis methods are discussed. In particular, the importance of the choice of photobleaching correction is stressed. This inexpensive method can be employed to study protein-protein interactions in many biological contexts. The calcium-sensing receptor (CaSR) is a G protein-coupled receptor (GPCR) that signals through Gq/11 and Gi/o to stimulate cytosolic calcium (Ca2+i) and mitogen-activated protein kinase (MAPK) signaling to control extracellular calcium homeostasis. Studies of loss- and gain-of-function CASR mutations, which cause familial hypocalciuric hypercalcemia type 1 (FHH1) and autosomal dominant hypocalcemia type 1 (ADH1), respectively, have revealed that the CaSR signals in a biased manner. Thus, some mutations associated with FHH1 lead to signaling predominantly through the MAPK pathway, whereas mutations associated with ADH1 preferentially enhance Ca2+i responses. We report a previously unidentified ADH1-associated R680G CaSR mutation, which led to the identification of a CaSR structural motif that mediates biased signaling. Expressing CaSRR680G in HEK 293 cells showed that this mutation increased MAPK signaling without altering Ca2+i responses. Moreover, this gain of function in MAPK activity occurred independently of Gq/11 and Gi/o and was mediated instead by a noncanonical pathway involving β-arrestin proteins. Homology modeling and mutagenesis studies showed that the R680G CaSR mutation selectively enhanced β-arrestin signaling by disrupting a salt bridge formed between Arg680 and Glu767, which are located in CaSR transmembrane domain 3 and extracellular loop 2, respectively. Thus, our results demonstrate CaSR signaling through β-arrestin and the importance of the Arg680-Glu767 salt bridge in mediating signaling bias. Primary cilia are required for Smoothened to transduce vertebrate Hedgehog signals, but how Smoothened accumulates in cilia and is activated is incompletely understood. Here, we identify cilia-associated oxysterols that promote Smoothened accumulation in cilia and activate the Hedgehog pathway. Our data reveal that cilia-associated oxysterols bind to two distinct Smoothened domains to modulate Smoothened accumulation in cilia and tune the intensity of Hedgehog pathway activation. We find that the oxysterol synthase HSD11β2 participates in the production of Smoothened-activating oxysterols and promotes Hedgehog pathway activity. Inhibiting oxysterol biosynthesis impedes oncogenic Hedgehog pathway activation and attenuates the growth of Hedgehog pathway-associated medulloblastoma, suggesting that targeted inhibition of Smoothened-activating oxysterol production may be therapeutically useful for patients with Hedgehog-associated cancers. The Hedgehog (Hh) pathway plays a central role in the development of multicellular organisms, guiding cell differentiation, proliferation and survival. While many components of the vertebrate pathway were discovered two decades ago, the mechanism by which the Hh signal is transmitted across the plasma membrane remains mysterious. This fundamental task in signalling is carried out by Smoothened (SMO), a human oncoprotein and validated cancer drug target that is a member of the G-protein coupled receptor protein family. Recent structural and functional studies have advanced our mechanistic understanding of SMO activation, revealing its unique regulation by two separable but allosterically-linked ligand-binding sites. Unexpectedly, these studies have nominated cellular cholesterol as having an instructive role in SMO signalling. Cholesterol is necessary for the function of many G-protein coupled receptors (GPCRs). We find that cholesterol is not just necessary but also sufficient to activate signaling by the Hedgehog (Hh) pathway, a prominent cell-cell communication system in development. Cholesterol influences Hh signaling by directly activating Smoothened (SMO), an orphan GPCR that transmits the Hh signal across the membrane in all animals. Unlike many GPCRs, which are regulated by cholesterol through their heptahelical transmembrane domains, SMO is activated by cholesterol through its extracellular cysteine-rich domain (CRD). Residues shown to mediate cholesterol binding to the CRD in a recent structural analysis also dictate SMO activation, both in response to cholesterol and to native Hh ligands. Our results show that cholesterol can initiate signaling from the cell surface by engaging the extracellular domain of a GPCR and suggest that SMO activity may be regulated by local changes in cholesterol abundance or accessibility. Ionotropic glutamate receptor (iGluR) family members are integrated into supramolecular complexes that modulate their location and function at excitatory synapses. However, a lack of structural information beyond isolated receptors or fragments thereof currently limits the mechanistic understanding of physiological iGluR signaling. Here, we report structural and functional analyses of the prototypical molecular bridge linking postsynaptic iGluR δ2 (GluD2) and presynaptic β-neurexin 1 (β-NRX1) via Cbln1, a C1q-like synaptic organizer. We show how Cbln1 hexamers "anchor" GluD2 amino-terminal domain dimers to monomeric β-NRX1. This arrangement promotes synaptogenesis and is essential for D: -serine-dependent GluD2 signaling in vivo, which underlies long-term depression of cerebellar parallel fiber-Purkinje cell (PF-PC) synapses and motor coordination in developing mice. These results lead to a model where protein and small-molecule ligands synergistically control synaptic iGluR function. Many guidance receptors are proteolytically cleaved by membrane-associated metalloproteases of the ADAM family, leading to the shedding of their ectodomains. Ectodomain shedding is crucial for receptor signaling and function, but how this process is controlled in neurons remains poorly understood. Here, we show that the transmembrane protein Lrig2 negatively regulates ADAM-mediated guidance receptor proteolysis in neurons. Lrig2 binds Neogenin, a receptor for repulsive guidance molecules (RGMs), and prevents premature Neogenin shedding by ADAM17 (TACE). RGMa reduces Lrig2-Neogenin interactions, providing ADAM17 access to Neogenin and allowing this protease to induce ectodomain shedding. Regulation of ADAM17-mediated Neogenin cleavage by Lrig2 is required for neurite growth inhibition by RGMa in vitro and for cortical neuron migration in vivo. Furthermore, knockdown of Lrig2 significantly improves CNS axon regeneration. Together, our data identify a unique ligand-gated mechanism to control receptor shedding by ADAMs and reveal functions for Lrigs in neuron migration and regenerative failure. Vertebrate Hedgehog (HH) signaling is controlled by several ligand-binding antagonists including Patched-1 (PTCH1), PTCH2, and HH-interacting protein 1 (HHIP1), whose collective action is essential for proper HH pathway activity. However, the molecular mechanisms used by these inhibitors remain poorly understood. In this paper, we investigated the mechanisms underlying HHIP1 antagonism of HH signaling. Strikingly, we found evidence that HHIP1 non-cell-autonomously inhibits HH-dependent neural progenitor patterning and proliferation. Furthermore, this non-cell-autonomous antagonism of HH signaling results from the secretion of HHIP1 that is modulated by cell type-specific interactions with heparan sulfate (HS). These interactions are mediated by an HS-binding motif in the cysteine-rich domain of HHIP1 that is required for its localization to the neuroepithelial basement membrane (BM) to effectively antagonize HH pathway function. Our data also suggest that endogenous, secreted HHIP1 localization to HS-containing BMs regulates HH ligand distribution. Overall, the secreted activity of HHIP1 represents a novel mechanism to regulate HH ligand localization and function during embryogenesis. Repulsive guidance molecules (RGMs) control crucial processes including cell motility, adhesion, immune-cell regulation and systemic iron metabolism. RGMs signal via the neogenin (NEO1) and the bone morphogenetic protein (BMP) pathways. Here, we report crystal structures of the N-terminal domains of all human RGM family members in complex with the BMP ligand BMP2, revealing a new protein fold and a conserved BMP-binding mode. Our structural and functional data suggest a pH-linked mechanism for RGM-activated BMP signaling and offer a rationale for RGM mutations causing juvenile hemochromatosis. 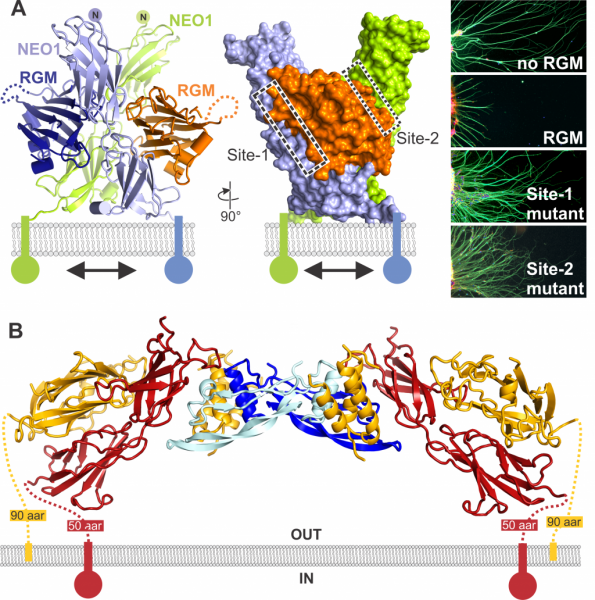 We also determined the crystal structure of the ternary BMP2-RGM-NEO1 complex, which, along with solution scattering and live-cell super-resolution fluorescence microscopy, indicates BMP-induced clustering of the RGM-NEO1 complex. Our results show how RGM acts as the central hub that links BMP and NEO1 and physically connects these fundamental signaling pathways. The Hedgehog (Hh) signal is transduced across the membrane by the heptahelical protein Smoothened (Smo), a developmental regulator, oncoprotein and drug target in oncology. We present the 2.3 Å crystal structure of the extracellular cysteine rich domain (CRD) of vertebrate Smo and show that it binds to oxysterols, endogenous lipids that activate Hh signaling. The oxysterol-binding groove in the Smo CRD is analogous to that used by Frizzled 8 to bind to the palmitoleyl group of Wnt ligands and to similar pockets used by other Frizzled-like CRDs to bind hydrophobic ligands. The CRD is required for signaling in response to native Hh ligands, showing that it is an important regulatory module for Smo activation. Indeed, targeting of the Smo CRD by oxysterol-inspired small molecules can block signaling by all known classes of Hh activators and by clinically relevant Smo mutants. DOI:http://dx.doi.org/10.7554/eLife.01340.001. The Hedgehog (Hh) signal is transduced across the membrane by the heptahelical protein Smoothened (Smo), a developmental regulator, oncoprotein and drug target in oncology. We present the 2.3 Å crystal structure of the extracellular cysteine rich domain (CRD) of vertebrate Smo and show that it binds to oxysterols, endogenous lipids that activate Hh signaling. The oxysterol-binding groove in the Smo CRD is analogous to that used by Frizzled 8 to bind to the palmitoleyl group of Wnt ligands and to similar pockets used by other Frizzled-like CRDs to bind hydrophobic ligands. The CRD is required for signaling in response to native Hh ligands, showing that it is an important regulatory module for Smo activation. Indeed, targeting of the Smo CRD by oxysterol-inspired small molecules can block signaling by all known classes of Hh activators and by clinically relevant Smo mutants. © Nachtergaele et al. Nearly 90% of human melanomas contain inactivated wild-type p53, the underlying mechanisms for which are not fully understood. Here, we identify that cyclin B1/CDK1-phosphorylates iASPP, which leads to the inhibition of iASPP dimerization, promotion of iASPP monomer nuclear entry, and exposure of its p53 binding sites, leading to increased p53 inhibition. Nuclear iASPP is enriched in melanoma metastasis and associates with poor patient survival. Most wild-type p53-expressing melanoma cell lines coexpress high levels of phosphorylated nuclear iASPP, MDM2, and cyclin B1. Inhibition of MDM2 and iASPP phosphorylation with small molecules induced p53-dependent apoptosis and growth suppression. Concurrent p53 reactivation and BRAFV600E inhibition achieved additive suppression in vivo, presenting an alternative for melanoma therapy. Ten years ago nothing was known of the three-dimensional structure of members of the semaphorin family of cell guidance cues, nor of their major receptors, the plexins. The structural biology of this cell surface ligand-receptor system has now come of age. Detailed atomic level information is available on the architecture of semaphorin and plexin ectodomains and their recognition complexes. Similarly the structure of the plexin cytoplasmic region, and its interactions with members of the Rho family of small GTPases have been unveiled. These structural analyses, in combination with biochemical, biophysical and cellular studies, have progressed our understanding of this signalling system into the realm of molecular mechanism. © 2012 Elsevier Ltd. Ten years ago nothing was known of the three-dimensional structure of members of the semaphorin family of cell guidance cues, nor of their major receptors, the plexins. The structural biology of this cell surface ligand-receptor system has now come of age. Detailed atomic level information is available on the architecture of semaphorin and plexin ectodomains and their recognition complexes. Similarly the structure of the plexin cytoplasmic region, and its interactions with members of the Rho family of small GTPases have been unveiled. These structural analyses, in combination with biochemical, biophysical and cellular studies, have progressed our understanding of this signalling system into the realm of molecular mechanism. Co-receptors add complexity to cell-cell signaling systems. The secreted semaphorin 3s (Sema3s) require a co-receptor, neuropilin (Nrp), to signal through plexin As (PlxnAs) in functions ranging from axon guidance to bone homeostasis, but the role of the co-receptor is obscure. Here we present the low-resolution crystal structure of a mouse semaphorin-plexin-Nrp complex alongside unliganded component structures. Dimeric semaphorin, two copies of plexin and two copies of Nrp are arranged as a dimer of heterotrimers. In each heterotrimer subcomplex, semaphorin contacts plexin, similar to in co-receptor-independent signaling complexes. The Nrp1s cross brace the assembly, bridging between sema domains of the Sema3A and PlxnA2 subunits from the two heterotrimers. 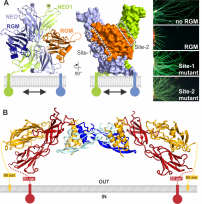 Biophysical and cellular analyses confirm that this Nrp binding mode stabilizes a canonical, but weakened, Sema3-PlxnA interaction, adding co-receptor control over the mechanism by which receptor dimerization and/or oligomerization triggers signaling. Traditional mammalian expression systems rely on the time-consuming generation of stable cell lines; this is difficult to accommodate within a modern structural biology pipeline. Transient transfections are a fast, cost-effective solution, but require skilled cell culture scientists, making man-power a limiting factor in a setting where numerous samples are processed in parallel. Here we report a strategy employing a customised CompacT SelecT cell culture robot allowing the large-scale expression of multiple protein constructs in a transient format. Successful protocols have been designed for automated transient transfection of human embryonic kidney (HEK) 293T and 293S GnTI - cells in various flask formats. Protein yields obtained by this method were similar to those produced manually, with the added benefit of reproducibility, regardless of user. Automation of cell maintenance and transient transfection allows the expression of high quality recombinant protein in a completely sterile environment with limited support from a cell culture scientist. The reduction in human input has the added benefit of enabling continuous cell maintenance and protein production, features of particular importance to structural biology laboratories, which typically use large quantities of pure recombinant proteins, and often require rapid characterisation of a series of modified constructs. This automated method for large scale transient transfection is now offered as a Europe-wide service via the P-cube initiative. © 2011 Elsevier Inc. The Protein Information Management System (PiMS) is a laboratory information management system (LIMS) designed for use with the production of proteins in a research environment. The software is distributed under the CCP4 licence, and so is available free of charge to academic laboratories. Like most LIMS, the underlying PiMS data model originally had no support for protein-protein complexes. To support the SPINE2-Complexes project the developers have extended PiMS to meet these requirements. The modifications to PiMS, described here, include data model changes, additional protocols, some user interface changes and functionality to detect when an experiment may have formed a complex. Example data are shown for the production of a crystal of a protein complex. Integration with SPINE2-Complexes Target Tracker application is also described. © 2011 Elsevier Inc.
Wnt morphogens control embryonic development and homeostasis in adult tissues. In vertebrates the N-terminal WIF domain (WIF-1 WD) of Wnt inhibitory factor 1 (WIF-1) binds Wnt ligands. Our crystal structure of WIF-1 WD reveals a previously unidentified binding site for phospholipid; two acyl chains extend deep into the domain, and the head group is exposed to the surface. Biophysical and cellular assays indicate that there is a WIF-1 WD Wnt-binding surface proximal to the lipid head group but also implicate the five epidermal growth factor (EGF)-like domains (EGFs I-V) in Wnt binding. The six-domain WIF-1 crystal structure shows that EGFs I-V are wrapped back, interfacing with WIF-1 WD at EGF III. EGFs II-V contain a heparan sulfate proteoglycan (HSPG)-binding site, consistent with conserved positively charged residues on EGF IV. This combination of HSPG-and Wnt-binding properties suggests a modular model for the localization of WIF-1 and for signal inhibition within morphogen gradients. © 2011 Nature America, Inc. All rights reserved. Plexins are cell surface receptors for the semaphorin family of cell guidance cues. The cytoplasmic region comprises a Ras GTPase-activating protein (GAP) domain and a RhoGTPase binding domain. Concomitant binding of extracellular semaphorin and intracellular RhoGTPase triggers GAP activity and signal transduction. The mechanism of this intricate regulation remains elusive. We present two crystal structures of the human Plexin-B1 cytoplasmic region in complex with a constitutively active RhoGTPase, Rac1. The structure of truncated Plexin-B1-Rac1 complex provides no mechanism for coupling RhoGTPase and Ras binding sites. On inclusion of the juxtamembrane helix, a trimeric structure of Plexin-B1-Rac1 complexes is stabilised by a second, novel, RhoGTPase binding site adjacent to the Ras site. Site-directed mutagenesis combined with cellular and biophysical assays demonstrate that this new binding site is essential for signalling. Our findings are consistent with a model in which extracellular and intracellular plexin clustering events combine into a single signalling output. Wnt morphogens control embryonic development and homeostasis in adult tissues. In vertebrates the N-terminal WIF domain (WIF-1(WD)) of Wnt inhibitory factor 1 (WIF-1) binds Wnt ligands. Our crystal structure of WIF-1(WD) reveals a previously unidentified binding site for phospholipid; two acyl chains extend deep into the domain, and the head group is exposed to the surface. Biophysical and cellular assays indicate that there is a WIF-1(WD) Wnt-binding surface proximal to the lipid head group but also implicate the five epidermal growth factor (EGF)-like domains (EGFs I-V) in Wnt binding. The six-domain WIF-1 crystal structure shows that EGFs I-V are wrapped back, interfacing with WIF-1(WD) at EGF III. EGFs II-V contain a heparan sulfate proteoglycan (HSPG)-binding site, consistent with conserved positively charged residues on EGF IV. This combination of HSPG- and Wnt-binding properties suggests a modular model for the localization of WIF-1 and for signal inhibition within morphogen gradients. The Protein Information Management System (PiMS) is a laboratory information management system (LIMS) designed for use with the production of proteins in a research environment. The software is distributed under the CCP4 licence, and so is available free of charge to academic laboratories. Like most LIMS, the underlying PiMS data model originally had no support for protein-protein complexes. To support the SPINE2-Complexes project the developers have extended PiMS to meet these requirements. The modifications to PiMS, described here, include data model changes, additional protocols, some user interface changes and functionality to detect when an experiment may have formed a complex. Example data are shown for the production of a crystal of a protein complex. Integration with SPINE2-Complexes Target Tracker application is also described. Traditional mammalian expression systems rely on the time-consuming generation of stable cell lines; this is difficult to accommodate within a modern structural biology pipeline. Transient transfections are a fast, cost-effective solution, but require skilled cell culture scientists, making man-power a limiting factor in a setting where numerous samples are processed in parallel. Here we report a strategy employing a customised CompacT SelecT cell culture robot allowing the large-scale expression of multiple protein constructs in a transient format. Successful protocols have been designed for automated transient transfection of human embryonic kidney (HEK) 293T and 293S GnTI⁻ cells in various flask formats. Protein yields obtained by this method were similar to those produced manually, with the added benefit of reproducibility, regardless of user. Automation of cell maintenance and transient transfection allows the expression of high quality recombinant protein in a completely sterile environment with limited support from a cell culture scientist. The reduction in human input has the added benefit of enabling continuous cell maintenance and protein production, features of particular importance to structural biology laboratories, which typically use large quantities of pure recombinant proteins, and often require rapid characterisation of a series of modified constructs. This automated method for large scale transient transfection is now offered as a Europe-wide service via the P-cube initiative. The structure of the human major histocompatability (MHC) class I molecule HLA-A*0301 (HLA-A3) in complex with a nonameric peptide (KLIETYFSK) has been determined by X-ray crystallography to 2.7 Å resolution. HLA-A3 is a predisposing allele for multiple sclerosis (MS), an autoimmune disease of the central nervous system. The KLIETYFSK peptide is a naturally processed epitope of proteolipid protein, a myelin protein and candidate target for immune-mediated myelin destruction in MS. Comparison of the structure of HLA-A3 with that of HLA-A2, an MHC class I molecule which is protective against MS, indicates that both MHC class I molecules present very similar faces for T-cell receptor recognition whilst differing in the specificity of their peptide-binding grooves. These characteristics may underlie the opposing (predisposing versus protective) associations that they exhibit both in humans and in mouse models of MS-like disease. Furthermore, subtle alterations within the peptide-binding groove of HLA-A3 and other A3-like MHC class I molecules, members of the so-called A3 superfamily, may be sufficient to alter their presentation of autoantigen peptides such as KLIETYFSK. This in turn may modulate their contribution to the associated risk of autoimmune disease. Heparan and chondroitin sulfate proteoglycans (HSPGs and CSPGs, respectively) regulate numerous cell surface signaling events, with typically opposite effects on cell function. CSPGs inhibit nerve regeneration through receptor protein tyrosine phosphatase sigma (RPTPσ). Here we report that RPTPσ acts bimodally in sensory neuron extension, mediating CSPG inhibition and HSPG growth promotion. Crystallographic analyses of a shared HSPG-CSPG binding site reveal a conformational plasticity that can accommodate diverse glycosaminoglycans with comparable affinities. Heparan sulfate and analogs induced RPTPσ ectodomain oligomerization in solution, which was inhibited by chondroitin sulfate. RPTPσ and HSPGs colocalize in puncta on sensory neurons in culture, whereas CSPGs occupy the extracellular matrix. These results lead to a model where proteoglycans can exert opposing effects on neuronal extension by competing to control the oligomerization of a common receptor. Cell-cell signalling of semaphorin ligands through interaction with plexin receptors is important for the homeostasis and morphogenesis of many tissues and is widely studied for its role in neural connectivity, cancer, cell migration and immune responses. SEMA4D and Sema6A exemplify two diverse vertebrate, membrane-spanning semaphorin classes (4 and 6) that are capable of direct signalling through members of the two largest plexin classes, B and A, respectively. In the absence of any structural information on the plexin ectodomain or its interaction with semaphorins the extracellular specificity and mechanism controlling plexin signalling has remained unresolved. Here we present crystal structures of cognate complexes of the semaphorin-binding regions of plexins B1 and A2 with semaphorin ectodomains (human PLXNB1(1-2)-SEMA4D(ecto) and murine PlxnA2(1-4)-Sema6A(ecto)), plus unliganded structures of PlxnA2(1-4) and Sema6A(ecto). These structures, together with biophysical and cellular assays of wild-type and mutant proteins, reveal that semaphorin dimers independently bind two plexin molecules and that signalling is critically dependent on the avidity of the resulting bivalent 2:2 complex (monomeric semaphorin binds plexin but fails to trigger signalling). In combination, our data favour a cell-cell signalling mechanism involving semaphorin-stabilized plexin dimerization, possibly followed by clustering, which is consistent with previous functional data. Furthermore, the shared generic architecture of the complexes, formed through conserved contacts of the amino-terminal seven-bladed β-propeller (sema) domains of both semaphorin and plexin, suggests that a common mode of interaction triggers all semaphorin-plexin based signalling, while distinct insertions within or between blades of the sema domains determine binding specificity. Hedgehog (Hh) proteins are secreted signaling molecules that mediate essential tissue-patterning events during embryonic development and function in tissue homeostasis and regeneration throughout life. Hh signaling is regulated by multiple mechanisms, including covalent lipid modification of the Hh protein and interactions with multiple protein and glycan partners. Unraveling the nature and effects of these interactions has proven challenging, but recent structural and biophysical studies of Hh proteins and active fragments of heparin, Ihog, Cdo, Boc, Hedgehog-interacting protein (Hhip), Patched (Ptc), and the monoclonal antibody 5E1 have added a new level of molecular detail to our understanding of how Hh signal response and distribution are regulated within tissues. We review these results and discuss their implications for understanding Hh signaling in normal and disease states. The EphA4 tyrosine kinase cell surface receptor regulates an array of physiological processes and is the only currently known class A Eph receptor that binds both A and B class ephrins with high affinity. We have solved the crystal structure of the EphA4 ligand binding domain alone and in complex with (1) ephrinB2 and (2) ephrinA2. This set of structures shows that EphA4 has significant conformational plasticity in its ligand binding face. In vitro binding data demonstrate that it has a higher affinity for class A than class B ligands. Structural analyses, drawing on previously reported Eph receptor structures, show that EphA4 in isolation and in complex with ephrinA2 resembles other class A Eph receptors but on binding ephrinB2 assumes structural hallmarks of the class B Eph receptors. This interactive plasticity reveals EphA4 as a structural chameleon, able to adopt both A and B class Eph receptor conformations, and thus provides a molecular basis for EphA-type cross-class reactivity. Maternal alloantibodies against the human platelet Ag (HPA)-1a allotype of the platelet beta(3) integrin GpIIb/IIIa can cause severe fetal or neonatal hemorrhage. Almost all anti-HPA-1a-immune mothers are homozygous for HPA-1b and carry HLA-DR52a (DRB3*0101). The single Pro(33) -->Leu substitution (HPA-1b-->HPA-1a) was previously predicted to create a binding motif for HLA-DR52a that can lead to alloimmunization. We have isolated six CD4(+) T cell clones from three such mothers, which all respond to intact HPA-1a(+), but not HPA-1b(+), platelets. We used them to define the "core" and "anchor" residues of this natural T cell epitope. Molecular modeling based on a recently published crystal structure can explain the preferential presentation of the Leu(33) (but not Pro(33) variant) by HLA-DR52a rather than the linked HLA-DR3 or the allelic DR52b. The modeling also predicts efficient anchoring at position 33 by several alternative hydrophobic alpha-amino acids; indeed, a recently identified variant with Val(33) is presented well to two clones, and is therefore potentially alloimmunogenic. Finally, these HPA-1a-specific T cell clones use a variety of T cell receptors, but all have a "Th1" (IFN-gamma-producing) profile and are suitable for testing selective immunotherapies that might be applicable in vivo. Hedgehog (Hh) morphogens have fundamental roles in development, whereas dysregulation of Hh signaling leads to disease. Multiple cell-surface receptors are responsible for transducing and/or regulating Hh signals. Among these, the Hedgehog-interacting protein (Hhip) is a highly conserved, vertebrate-specific inhibitor of Hh signaling. We have solved a series of crystal structures for the human HHIP ectodomain and Desert hedgehog (DHH) in isolation, as well as HHIP in complex with DHH (HHIP-DHH) and Sonic hedgehog (Shh) (HHIP-Shh), with and without Ca2+. The interaction determinants, confirmed by biophysical studies and mutagenesis, reveal previously uncharacterized and distinct functions for the Hh Zn2+ and Ca2+ binding sites--functions that may be common to all vertebrate Hh proteins. Zn2+ makes a key contribution to the Hh-HHIP interface, whereas Ca2+ is likely to prevent electrostatic repulsion between the two proteins, suggesting an important modulatory role. This interplay of several metal binding sites suggests a tuneable mechanism for regulation of Hh signaling. Ra-KLP, a 75 amino acid protein secreted by the salivary gland of the brown ear tick Rhipicephalus appendiculatus has a sequence resembling those of Kunitz/BPTI proteins. We report the detection, purification and characterization of the function of Ra-KLP. In addition, determination of the three-dimensional crystal structure of Ra-KLP at 1.6 A resolution using sulphur single-wavelength anomalous dispersion reveals that much of the loop structure of classical Kunitz domains, including the protruding protease-binding loop, has been replaced by beta-strands. Even more unusually, the N-terminal portion of the polypeptide chain is pinned to the "Kunitz head" by two disulphide bridges not found in classical Kunitz/BPTI proteins. The disulphide bond pattern has been further altered by the loss of the bridge that normally stabilizes the protease-binding loop. Consistent with the conversion of this loop into a beta-strand, Ra-KLP shows no significant anti-protease activity; however, it activates maxiK channels in an in vitro system, suggesting a potential mechanism for regulating host blood supply during feeding. We review here recent results on the structure and function of a receptor protein tyrosine phosphatase, RPTPmicro. In addition to their intercellular catalytic domains which bear the phosphatase activity, the RPTPs are cell-surface-receptor-type molecules and in many cases have large extracellular regions. What role can these extracellular regions play in function? For RPTPmicro, the extracellular region is known to mediate homophilic adhesion. Sequence analysis indicates that it comprises six domains: an N-terminal MAM (meprin/A5/micro), one immunoglobulin-like domain and four fibronectin type III (FN) repeats. We have determined the crystal structure of the entire extracellular region for RPTPmicro in the form of a functional adhesion dimer. The physical characteristics and dimensions of the adhesion dimer suggest a mechanism by which the location of this phosphatase can be influenced by cell-cell spacings. ASPP1 and ASPP2 are activators of p53-dependent apoptosis, whereas iASPP is an inhibitor of p53. Binding assays showed differential binding for C-terminal domains of iASPP and ASPP2 to the core domains of p53 family members p53, p63, and p73. We also determined a high-resolution crystal structure for the C terminus of iASPP, comprised of four ankyrin repeats and an SH3 domain. The crystal lattice revealed an interaction between eight sequential residues in one iASPP molecule and the p53-binding site of a neighboring molecule. ITC confirmed that a peptide corresponding to the crystallographic interaction shows specific binding to iASPP. The contributions of ankyrin repeat residues, in addition to those of the SH3 domain, generate distinctive architecture at the p53-binding site suitable for inhibition by small molecules. These results suggest that the binding properties of iASPP render it a target for antitumor therapeutics and provide a peptide-based template for compound design. We review here recent results on the structure and function of a receptor protein tyrosine phosphatase, RPTPμ. In addition to their intercellular catalytic domains which bear the phosphatase activity, the RPTPs are cell-surface-receptor-type molecules and in many cases have large extracellular regions. What role can these extracellular regions play in function? For RPTPμ, the extracellular region is known to mediate homophilic adhesion. Sequence analysis indicates that it comprises six domains: an N-terminal MAM (meprin/A5/μ), one immunoglobulin-like domain and four fibronectin type III (FN) repeats. We have determined the crystal structure of the entire extracellular region for RPTPμ in the form of a functional adhesion dimer. The physical characteristics and dimensions of the adhesion dimer suggest a mechanism by which the location of this phosphatase can be influenced by cell-cell spacings. © 2008 Biochemical Society. We have recently reported a missense mutation in exon 4 of the tubulin alpha 1A (Tuba1a) gene in a hyperactive N-ethyl-N-nitrosourea (ENU) induced mouse mutant with abnormal lamination of the hippocampus. Neuroanatomical similarities between the Tuba1a mutant mouse and mice deficient for Doublecortin (Dcx) and Lis1 genes, and the well-established functional interaction between DCX and microtubules (MTs), led us to hypothesize that mutations in TUBA1A (TUBA3, previous symbol), the human homolog of Tuba1a, might give rise to cortical malformations. This hypothesis was subsequently confirmed by the identification of TUBA1A mutations in two patients with lissencephaly and pachygyria, respectively. Here we report additional TUBA1A mutations identified in six unrelated patients with a large spectrum of brain dysgeneses. The de novo occurrence was shown for all mutations, including one recurrent mutation (c.790C>T, p.R264C) detected in two patients, and two mutations that affect the same amino acid (c.1205G>A, p.R402H; c.1204C>T, p.R402C) detected in two other patients. Retrospective examination of MR images suggests that patients with TUBA1A mutations share not only cortical dysgenesis, but also cerebellar, hippocampal, corpus callosum, and brainstem abnormalities. Interestingly, the specific high level of Tuba1a expression throughout the period of central nervous system (CNS) development, shown by in situ hybridization using mouse embryos, is in accordance with the brain-restricted developmental phenotype caused by TUBA1A mutations. All together, these results, in combination with previously reported data, strengthen the relevance of the known interaction between MTs and DCX, and highlight the importance of the MTs/DCX complex in the neuronal migration process. Cell-cell contacts are fundamental to multicellular organisms and are subject to exquisite levels of control. Human RPTPmu is a type IIB receptor protein tyrosine phosphatase that both forms an adhesive contact itself and is involved in regulating adhesion by dephosphorylating components of cadherin-catenin complexes. Here we describe a 3.1 angstrom crystal structure of the RPTPmu ectodomain that forms a homophilic trans (antiparallel) dimer with an extended and rigid architecture, matching the dimensions of adherens junctions. Cell surface expression of deletion constructs induces intercellular spacings that correlate with the ectodomain length. These data suggest that the RPTPmu ectodomain acts as a distance gauge and plays a key regulatory function, locking the phosphatase to its appropriate functional location. TdPI, a tick salivary gland product related to Kunitz/BPTI proteins is a potent inhibitor of human beta-tryptase. Kinetic assays suggest that three of the four catalytic sites of tryptase are blocked by TdPI, and that the inhibition of one of these involves a peptide flanking the Kunitz head. In the course of the inhibition, tryptase cleaves TdPI at several positions. Crystal structures of the TdPI head, on its own and in complex with trypsin, reveal features that are not found in classical Kunitz/BPTI proteins and suggest the mode of interaction with tryptase. The loop of TdPI connecting the beta-sheet with the C-terminal alpha-helix is shortened, the disulphide-bridge pattern altered and N and C termini separated to produce a highly pointed molecule capable of penetrating the cramped active sites of tryptase. TdPI accumulates in the cytosolic granules of mast cells, presumably suppressing inflammation in the host animal's skin by tryptase inhibition. T-cell recognition of the antigenic peptides presented by MHC class I molecules normally triggers protective immune responses, but can result in immune enhancement of disease. Cross-reactive T-cell responses may underlie immunopathology in dengue haemorrhagic fever. To analyze these effects at the molecular level, the functional MHC class I molecule HLA-A*1101 was crystallized bound to six naturally occurring peptide variants from the dengue virus NS3 protein. The crystals contained high levels of solvent and required optimization of the cryoprotectant and dehydration protocols for each complex to yield well ordered diffraction, a process that was facilitated by the use of a free-mounting system. The development of the mammalian brain is dependent on extensive neuronal migration. Mutations in mice and humans that affect neuronal migration result in abnormal lamination of brain structures with associated behavioral deficits. Here, we report the identification of a hyperactive N-ethyl-N-nitrosourea (ENU)-induced mouse mutant with abnormalities in the laminar architecture of the hippocampus and cortex, accompanied by impaired neuronal migration. We show that the causative mutation lies in the guanosine triphosphate (GTP) binding pocket of alpha-1 tubulin (Tuba1) and affects tubulin heterodimer formation. Phenotypic similarity with existing mouse models of lissencephaly led us to screen a cohort of patients with developmental brain anomalies. We identified two patients with de novo mutations in TUBA3, the human homolog of Tuba1. This study demonstrates the utility of ENU mutagenesis in the mouse as a means to discover the basis of human neurodevelopmental disorders. The EC 'Structural Proteomics In Europe' contract is aimed specifically at the atomic resolution structure determination of human protein targets closely linked to health, with a focus on cancer (kinesins, kinases, proteins from the ubiquitin pathway), neurological development and neurodegenerative diseases and immune recognition. Despite the challenging nature of the analysis of such targets, approximately 170 structures have been determined to date. Here, the impact of high-throughput technologies, such as parallel expression of multiple constructs, the use of standardized refolding protocols and optimized crystallization screens or the use of mass spectrometry to assist sample preparation, on the structural biology of mammalian protein targets is illustrated through selected examples. The Structural Proteomics In Europe (SPINE) consortium contained a workpackage to address the automated X-ray analysis of macromolecules. The aim of this workpackage was to increase the throughput of three-dimensional structures while maintaining the high quality of conventional analyses. SPINE was able to bring together developers of software with users from the partner laboratories. Here, the results of a workshop organized by the consortium to evaluate software developed in the member laboratories against a set of bacterial targets are described. The major emphasis was on molecular-replacement suites, where automation was most advanced. Data processing and analysis, use of experimental phases and model construction were also addressed, albeit at a lower level. MHC class II molecules on the surface of antigen-presenting cells display a range of peptides for recognition by the T-cell receptors of CD4+ T helper cells. Therefore, MHC class II molecules are central to effective adaptive immune responses, but conversely, genetic and epidemiological data have implicated these molecules in the pathogenesis of autoimmune diseases. Indeed, the strength of the associations between particular MHC class II alleles and disease render them the main genetic risk factors for autoimmune disorders such as type 1 diabetes. Here, we discuss the insights that the crystal structures of MHC class II molecules provide into the molecular mechanisms by which sequence polymorphisms might contribute to disease susceptibility. Type IIB receptor protein tyrosine phosphatases (RPTPs) are bi-functional cell surface molecules. Their ectodomains mediate stable, homophilic, cell-adhesive interactions, whereas the intracellular catalytic regions can modulate the phosphorylation state of cadherin/catenin complexes. We describe a systematic investigation of the cell-adhesive properties of the extracellular region of RPTPmu, a prototypical type IIB RPTP. The crystal structure of a construct comprising its N-terminal MAM (meprin/A5/mu) and Ig domains was determined at 2.7 A resolution; this assigns the MAM fold to the jelly-roll family and reveals extensive interactions between the two domains, which form a rigid structural unit. Structure-based site-directed mutagenesis, serial domain deletions and cell-adhesion assays allowed us to identify the four N-terminal domains (MAM, Ig, fibronectin type III (FNIII)-1 and FNIII-2) as a minimal functional unit. Biophysical characterization revealed at least two independent types of homophilic interaction which, taken together, suggest that there is the potential for formation of a complex and possibly ordered array of receptor molecules at cell contact sites. Dihydroxyacetone (Dha) kinases are a family of sequence-conserved enzymes which utilize either ATP (in animals, plants and eubacteria) or phosphoenolpyruvate (PEP, in eubacteria) as their source of high-energy phosphate. The kinases consist of two domains/subunits: DhaK, which binds Dha covalently in hemiaminal linkage to the Nepsilon2 of a histidine, and DhaL, an eight-helix barrel that contains the nucleotide-binding site. The PEP-dependent kinases comprise a third subunit, DhaM, which rephosphorylates in situ the firmly bound ADP cofactor. DhaM serves as the shuttle for the transfer of phosphate from the bacterial PEP: carbohydrate phosphotransferase system (PTS) to the Dha kinase. The DhaL and DhaK subunits of the PEP-dependent Escherichia coli kinase act as coactivator and corepressor of DhaR, a transcription factor from the AAA(+) family of enhancerbinding proteins. In Gram-positive bacteria genes for homologs of DhaK and DhaL occur in operons for putative transcription factors of the TetR and DeoR families. Proteins with the Dha kinase fold can be classified into three families according to phylogeny and function: Dha kinases, DhaK and DhaL homologs (paralogs) associated with putative transcription regulators of the TetR and DeoR families, and proteins with a circularly permuted domain order that belong to the DegV family. Semaphorins are extracellular cell guidance cues that govern cytoskeletal dynamics during neuronal and vascular development. MICAL (molecule interacting with CasL) is a multidomain cytosolic protein with a putative flavoprotein monooxygenase (MO) region required for semaphorin-plexin repulsive axon guidance. Here, we report the 1.45-A resolution crystal structure of the FAD-containing MO domain of mouse MICAL-1 (residues 1-489). The topology most closely resembles that of the NADPH-dependent flavoenzyme p-hydroxybenzoate hydroxylase (PHBH). Comparison of structures before and after reaction with NADPH reveals that, as in PHBH, the flavin ring can switch between two discrete positions. In contrast with other MOs, this conformational switch is coupled with the opening of a channel to the active site, suggestive of a protein substrate. In support of this hypothesis, distinctive structural features highlight putative protein-binding sites in suitable proximity to the active site entrance. The unusual juxtaposition of this N-terminal MO (hydroxylase) activity with the characteristics of a multiprotein-binding scaffold exhibited by the C-terminal portion of the MICALs represents a unique combination of functionality to mediate signaling. Crystallization trials at the Division of Structural Biology in Oxford are now almost exclusively carried out using a high-throughput workflow implemented in the Oxford Protein Production Facility. Initial crystallization screening is based on nanolitre-scale sitting-drop vapour-diffusion experiments (typically 100 nl of protein plus 100 nl of reservoir solution per droplet) which use standard crystallization screening kits and 96-well crystallization plates. For 294 K crystallization trials the barcoded crystallization plates are entered into an automated storage system with a fully integrated imaging system. These plates are imaged in accordance with a pre-programmed schedule and the resulting digital data for each droplet are harvested into a laboratory information-management system (LIMS), scored by crystal recognition software and displayed for user analysis via a web-based interface. Currently, storage for trials at 277 K is not automated and for imaging the crystallization plates are fed by hand into an imaging system from which the data enter the LIMS. The workflow includes two procedures for nanolitre-scale optimization of crystallization conditions: (i) a protocol for variation of pH, reservoir dilution and protein:reservoir ratio and (ii) an additive screen. Experience based on 592 crystallization projects is reported. Multiple sclerosis (MS) is an autoimmune disease with an important genetic component. The strongest genetic association is with the major histocompatibility complex (MHC) region. Several MHC alleles predispose to the disease, the most prominent of which are certain alleles in the HLA-DR2 haplotype. Functional and structural studies have helped to explain the molecular basis of these associations. Although there is currently no curative treatment for MS, an increased understanding of the disease has aided the design of immunotherapies that act on the immune system more specifically than the longstanding drugs. Many of these therapies work at the antigen-specific level, disrupting the interaction between T-cell receptors and MHC molecules that leads to disease. Banna virus (BAV: genus Seadornavirus, family Reoviridae) has a double-shelled morphology similar to rotavirus and bluetongue virus. The structure of BAV outer-capsid protein VP9 was determined by X-ray crystallography at 2.6 A resolution, revealing a trimeric molecule, held together by an N-terminal helical bundle, reminiscent of coiled-coil structures found in fusion-active proteins such as HIV gp41. The major domain of VP9 contains stacked beta sheets with marked structural similarities to the receptor binding protein VP8 of rotavirus. Anti-VP9 antibodies neutralize viral infectivity, and, remarkably, pretreatment of cells with trimeric VP9 increased viral infectivity, indicating that VP9 is involved in virus attachment to cell surface and subsequent internalization. Sequence similarities were also detected between BAV VP10 and VP5 portion of rotavirus VP4, suggesting that the receptor binding and internalization apparatus, which is a single gene product activated by proteoloysis in rotavirus, is the product of two separate genome segments in BAV. The MHC class II molecule DQ0602 confers strong susceptibility to narcolepsy but dominant protection against type 1 diabetes. The crystal structure of DQ0602 reveals the molecular features underlying these contrasting genetic properties. Structural comparisons to homologous DQ molecules with differential disease associations highlight a previously unrecognized interplay between the volume of the P6 pocket and the specificity of the P9 pocket, which implies that presentation of an expanded peptide repertoire is critical for dominant protection against type 1 diabetes. In narcolepsy, the volume of the P4 pocket appears central to the susceptibility, suggesting that the presentation of a specific peptide population plays a major role. Dihydroxyacetone (Dha) kinases are a sequence-conserved family of enzymes, which utilize two different phosphoryldonors, ATP in animals, plants, and some bacteria, and a multiphosphoprotein of the phosphoenolpyruvate carbohydrate phosphotransferase system (PTS) in most bacteria. Here, we compare the PTS-dependent kinase of Escherichia coli and the ATP-dependent kinase of Citrobacter freundii. They display 30% sequence identity. The binding constants of the E. coli kinase for eleven short-chain carbonyl compounds were determined by acetone precipitation of the enzyme-substrate complexes. They are 3.4 microM for Dha, 780 microM for Dha-phosphate (DhaP), 50 microM for D,L-glyceraldehyde (GA), and 90 microM for D,L-glyceraldehyde-3-phosphate. The k(cat) for Dha of the PTS-dependent kinase is 290 min(-1), and that of the ATP-dependent kinase is 1050 min(-1). The Km for Dha of both kinases is <6 microM. The X-ray structures of the enzyme-GA and the enzyme-DhaP complex show that substrates as well as products are bound in hemiaminal linkage to an active-site histidine. Quantum-mechanical calculations offer no indication for activation of the reacting hydroxyl group by the formation of the hemiaminal. However, the formation of the hemiaminal bond allows selection for short-chain carbonyl compounds and discrimination against structurally similar polyols. The Dha kinase remains fully active in the presence of 2 M glycerol, and phosphorylates trace impurities of carbonyl compounds present in glycerol. Dihydroxyacetone kinases are a sequence-conserved family of enzymes, which utilize two different phosphoryldonors, ATP in animals, plants and some bacteria, and a multiphosphoprotein of the phosphoenolpyruvate carbohydrate phosphotransferase system in bacteria. Here we report the 2.5-A crystal structure of the homodimeric Citrobacter freundii dihydroxyacetone kinase complex with an ATP analogue and dihydroxyacetone. The N-terminal domain consists of two alpha/beta-folds with a molecule of dihydroxyacetone covalently bound in hemiaminal linkage to the N epsilon 2 of His-220. The C-terminal domain consists of a regular eight-helix alpha-barrel. The eight helices form a deep pocket, which includes a tightly bound phospholipid. Only the lipid headgroup protrudes from the surface. The nucleotide is bound on the top of the barrel across from the entrance to the lipid pocket. The phosphate groups are coordinated by two Mg2+ ions to gamma-carboxyl groups of aspartyl residues. The ATP binding site does not contain positively charged or aromatic groups. Paralogues of dihydroxyacetone kinase also occur in association with transcription regulators and proteins of unknown function pointing to biological roles beyond triose metabolism. Dihydroxyacetone (Dha) kinases are homologous proteins that use different phosphoryl donors, a multiphosphoryl protein of the phosphoenolpyruvate-dependent carbohydrate:phosphotransferase system in bacteria, ATP in animals, plants, and some bacteria. The Dha kinase of Escherichia coli consists of three subunits, DhaK and DhaL, which are colinear to the ATP-dependent Dha kinases of eukaryotes, and the multiphosphoryl protein DhaM. Here we show the crystal structure of the DhaK subunit in complex with Dha at 1.75 A resolution. DhaK is a homodimer with a fold consisting of two six-stranded mixed beta-sheets surrounded by nine alpha-helices and a beta-ribbon covering the exposed edge strand of one sheet. The core of the N-terminal domain has an alpha/beta fold common to subunits of carbohydrate transporters and transcription regulators of the phosphoenolpyruvate-dependent carbohydrate:phosphotransferase system. The core of the C-terminal domain has a fold similar to the C-terminal domain of the cell-division protein FtsZ. A molecule of Dha is covalently bound in hemiaminal linkage to the N epsilon 2 of His-230. The hemiaminal does not participate in covalent catalysis but is the chemical basis for discrimination between short-chain carbonyl compounds and polyols. Paralogs of Dha kinases occur in association with transcription regulators of the TetR/QacR and the SorC families, pointing to their biological role as sensors in signaling.